On Monday August 21st, 2017 all of North America will experience a solar eclipse. 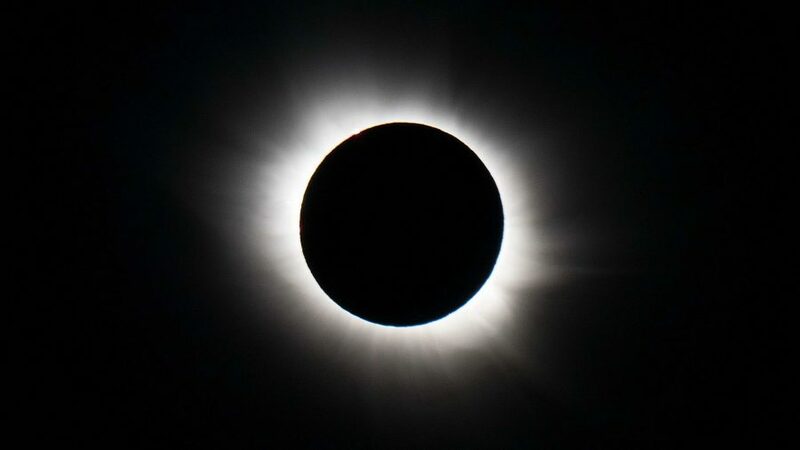 The Moon will move toward covering the Sun for 2 to 3 hours and will completely block the Sun for up to 2 minutes and 40 seconds. In Atlanta, this wondrous event will begin at 1:05pm with a maximum coverage of approximately 97% at 2:36pm, then things will be back to normal by 4:01pm. As noted by thousands of articles, viewing through a safe solar filter is absolutely essential to protect your eyes – make sure you get the right glasses! So that’s about all the science and numbers I’ll cover in this blog post.. Instead, I’ll ponder the Eclipse from a more yogic point of view. For sure this is one of the coolest events to witness and we’re all a tad excited to say the least! It’s rare to see the Natural become the Supernatural, where in a matter of minutes day becomes night, temperatures drop, and stars magically appear in the sky. The animals become quiet and prepare to rest, the bats come out to hunt, and a hush drops over us like a sacred veil. It truly feels like a Sacred event, something to be revered and feel inspired by. In yoga, we practice Sun Salutations and Moon Salutations honoring the monthly lunar cycle. We all know the power and heat of the Sun’s energy: our planet could not exist without it. We also enjoy the cool luminous beauty of the Moon and the quiet of the night sky. The two are a perfect pair – light and dark, heat and cool, breath in to breath out – complete in their interrelatedness. The idea that the Light is slowly taken over by the Dark, then they emerge as one, and then the Light appears again is profound. It seems like a metaphor that nothing remains Light or Dark, a constant interplay of movement and pulsation…a Divine dance of the Cosmos if you will. Maybe nothing IS all light or all dark: it’s the angle upon which one views the subject. Reality can be in the eyes of the beholder and we see things through our own filters. Blurred lines and boundaries expand and contract in a matter of minutes. This heightened energy can be exciting but maybe leaves us a tad uneasy – will our Sun come back? The Eclipse releases a potent energy and stirs us up. Emotions both positive and negative can be heightened and miscommunications are possible. It’s important to be especially mindful of our thoughts, words, and actions. There can be a profound pull on our consciousness. The Eclipse can help us see things in a new light, or from both sides. This seems like a most needed energy in this time of unrest and division. Might we see how light and dark become one for a very brief pause in time? It’s beautiful, powerful, and extraordinary in the overlap. Could we become One in Peace and Harmony? May we be still and reverent during this lovely event and enjoy the pull toward the ONE huge energy of Sun and Moon. Set your intentions that this huge event might shift us toward a more unified Presence, may that energy be fueled by Love. So beautiful Ruth Ann. Lovely description of things to notice during this spectacular event. yes, may we shift towards a ” more unified Presence, may that energy be fueled by Love.” I just love that RA. Poetic. Lovely. I may quote you (using you name and blog of course) if you don’t mind!! Happy to be sharing this time with you on this planet. Thank you for the thoughtful perspective on this historic event and a reminder that light and dark, both co-exist in us all. When so much has been about tragedy lately, it is grand to be uniting (countrywide) for a good thing, this gift (as long as you’re wearing the glasses:) from the Cosmos!